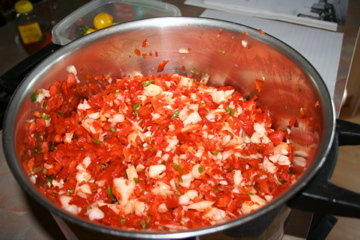 When September rolls around and the red peppers start showing up at the Farmers’ Market, I get out my canning equipment and make red pepper relish. I’ve had this recipe more than 25 years, having gotten it from the mother of an old boyfriend. She was an exceptional cook, and in the early 1980s, I had never tasted anything as sophisticated as red pepper relish over cream cheese spread on water crackers. I lost track of the boyfriend long ago, but the recipe gets used every fall. Jars of red pepper relish ready for the pantry! I’ve never had good luck growing red peppers, so I usually buy them, but I picked a few Haralson apples from my tree to use in the relish. This recipe makes 9-10 half pints, which is a nice size for gift giving. There is a waiting period in the middle of the recipe, so plan to start early in the day or even the night before. Mix all this together in a large pot and let it sit for 3 to 6 hours. It will look like the photo above right. Thyme or tarragon, if you’d like. Put the pan on the heat and boil the mixture for 30 to 45 minutes. (The recipe says 30, but it’s always more.) It should thicken and look like the picture at left. (Be warned: Your house will stink like vinegar when you do this! Open the windows, because it’s worth it.) While the mixture is boiling, get out jars and lids, wash them, and put a huge pot of water on the boil. (If you’ve never canned before, check out this site.) Sterilize the jars. 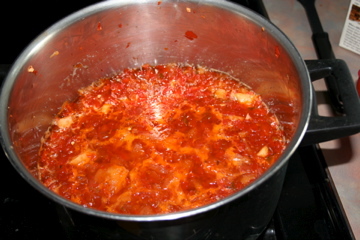 When the mixture is ready, spoon the relish into jars, wipe the tops, screw on the lids, and process for 10 minutes in a boiling water bath. Let the jars cool completely before storing. In addition to the appetizer mentioned above, the relish livens up any bland dish. It’s great on top of butternut squash soup or macaroni and cheese. Hi Mary, we still have a bunch of red peppers at our house-this recipe looks like a great way to use them. I’m a great fan of red pepper relish (recently blogged the recipe my mother-in-law uses), but I haven’t tried one that included hot peppers and apples. Looks great. I’ll give it a go next fall.